The rushes fringing the shallow pool were the greenest of verdant greens. The bottom of the pool was peat brown and the water glassy calm making perfect reflections. 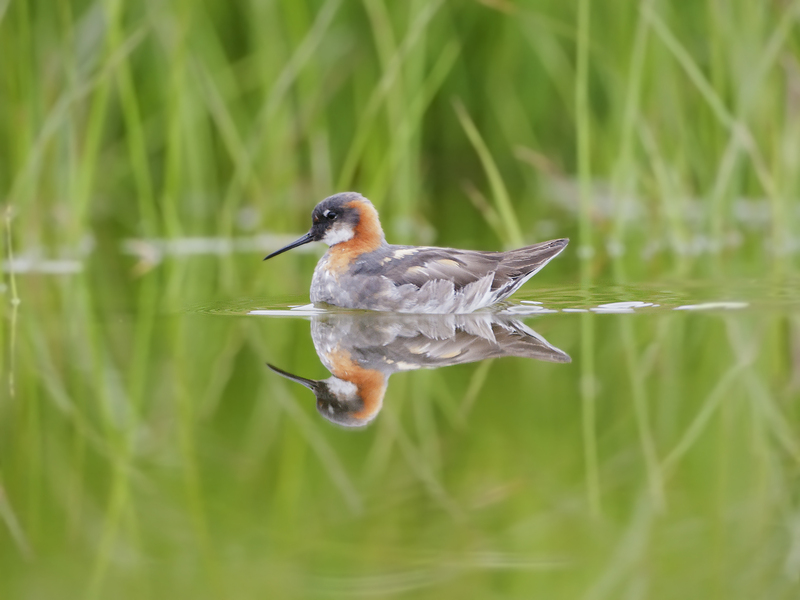 The Red-necked Phalarope family had been joined by another male and they outnumbered the observers 4 to 2. Throughout the time photographing at the pool the birds carried on as if we weren't there. They fed, preened and even roosted while we took our pictures. I took many and after looking through them (enjoying the memories they brought back) I settled on my favourite five images that I felt captured the moments I shared with these shorebirds. The pictures are a personal account of our encounter. They are a "Therefore I travel" moment. This is what the stuffing the kit into a bulging suitcase was for, it made queing at airport security with a rowdy school field trip bearable. It made the drive from Keflavik airport in a howling gale (I honestly thought we were going to be blown from the road) worthwhile. I lay down on the soft cool grass bordering the pool so I could get a good low angle of view and to be as unobtrusive as possible. Then I started to look for my pictures. Watching the birds going about their routine I worked out what I wanted to remember from this and started to do my best to record them. Rushes and their reflection framing the bird. 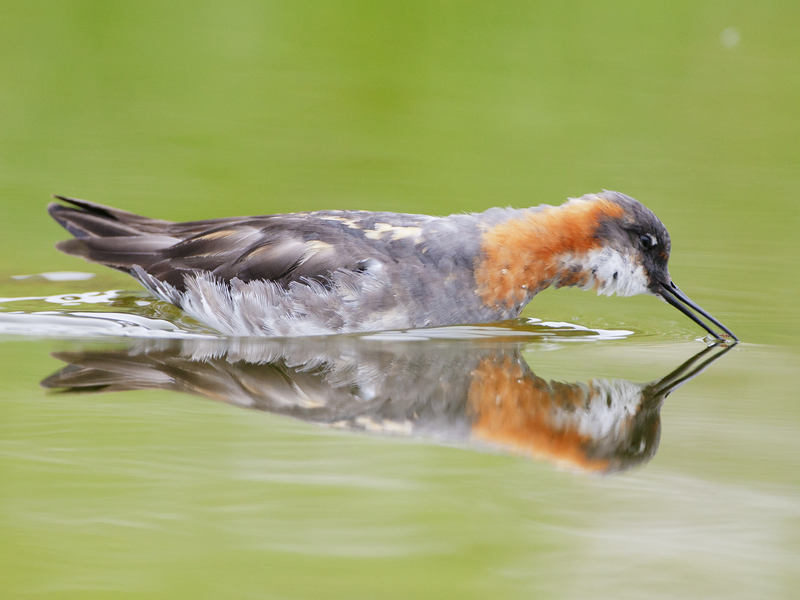 Feather maintenance is so important for long distance migrants. The calmness of the pool and the relaxed comfort I feel when close to migratory shorebirds. A shot for me this one. With any set of pictures I usually end up with a fovourite. It might not be the sharpest, it might not be everyone's cup of tea, but that is why I like photography. It can mean nothing to the observer and everything to the photographer. 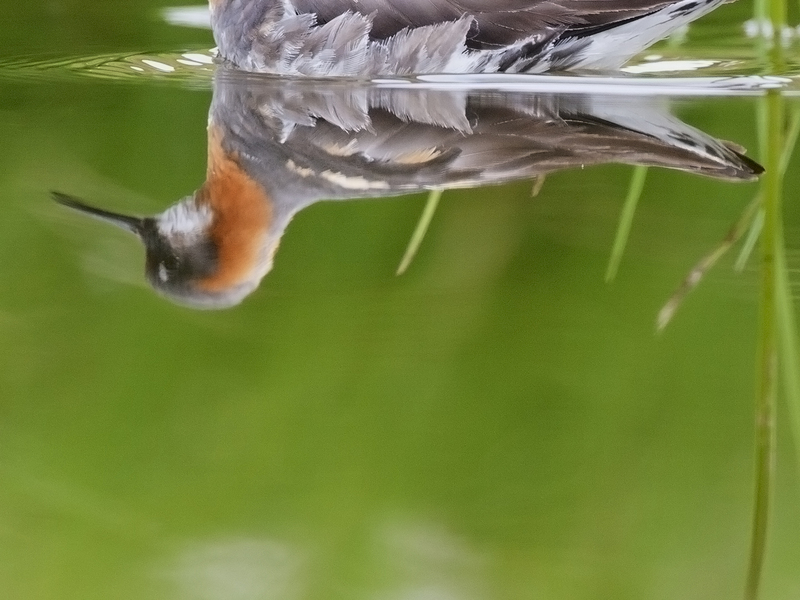 When I look at this picture I see the tranquility of the pool, the number of phalaropes doubled by reflection. I can remember the smell of the soil and recall the not entirely unpleasant coldness of the ground. 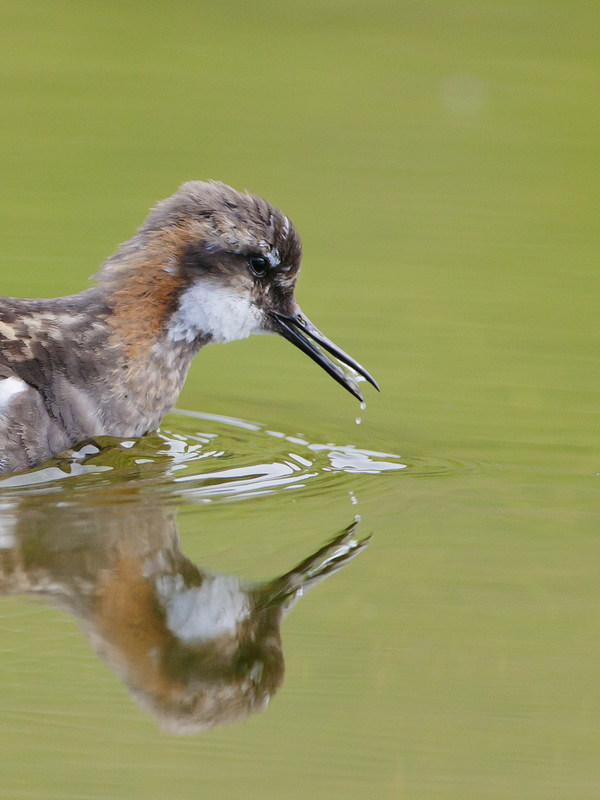 I can hear the gurgle of a madly paddling chick and I remember seeing my picture. A tiny midgy fly was emerging from the surface of the water, sturggling to break the aforemention surface tension. The Phalarope bends and stretches and almost immediately the fly was free of the water it disappeared down the red neck of the Red-necked Phalarope. That was the moment.